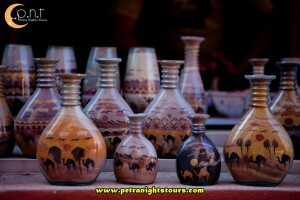 The shopping experience for a souvenir in Jordan is a mixture of modernity and tradition. 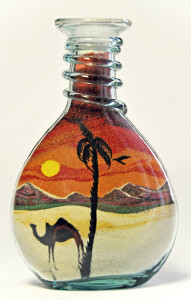 A popular souvenir to grab are decorated bottles filled with brightly colored sands, made by artisans in Petra and Aqaba. The designs in the sand is done with the aid of a knitting needle and a funnel. They are nice, colorful and some of them have detailed designs. 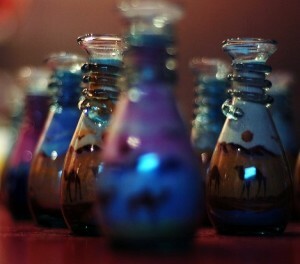 Prices depends on the design, quality of the sand used (natural or dyed) and size of the bottles.